Hi there! Matthias here, your friendly Diversity Dashboard data translator! Data Stories is a weekly blog series that brings you the latest trends and takeaways from the Diversity Dashboard. I’m here to help you make sense of the numbers and share insightful narratives about the results. Are you interested in a specific demographic relationship? Curious about the trend of young government leaders in office since November 2016? How about comparing the level of racial minority leaders present in different regions of the US? Does Atlanta, Georgia have a diverse group of leaders to match the diversity found among the city’s constituents? This week we are exploring some overarching demographic themes the data is telling us. Lets dive in! As more surveys get completed, we will be monitoring minority visibility in your community leaders. Yet, even now there is insight to be gained when recognizing over 25% of the surveys gave no response to racial makeup of leadership. Currently we are brainstorming ways to decrease the “no response” rate to offer a truer representation of your leaders on the dashboard. Many media outlets are reporting an uptick in the election of younger leaders in local communities since November 2016. As we continue to update the dashboard it will be interesting to note the rate of leaders under 50 (making up less than 25% of current local leadership) while following the current trend of baby boomers in public office. Again, we see that the no response rate is creating an obvious hole in our data narrative. We will continue to monitor this large percentage, potentially changing survey options to require a response. Noting that 12 surveys responded with “not listed” we can dig deeper into these entries to find out why. Do any of the 12 “not listed” responses indicate there are those who don’t see themselves as a binary gender? As we explore the individual entries, we can see that most of these “not listed” responses are indicative of vacancies in leadership positions, not by gender non-conforming leaders. Dissecting data in this way helps us evolve our methodology with updated survey question formats. Perhaps by offering an answering option specifically for municipalities with a currently vacant position, the dashboard may increase accuracy and transparency in its demographic portrayal of our local leaders. Thanks for tuning in to the first installment of Data Stories! With Data Stories, unearthing demographic relationships can help us build factual narratives that cultivate transparency in our government leadership. 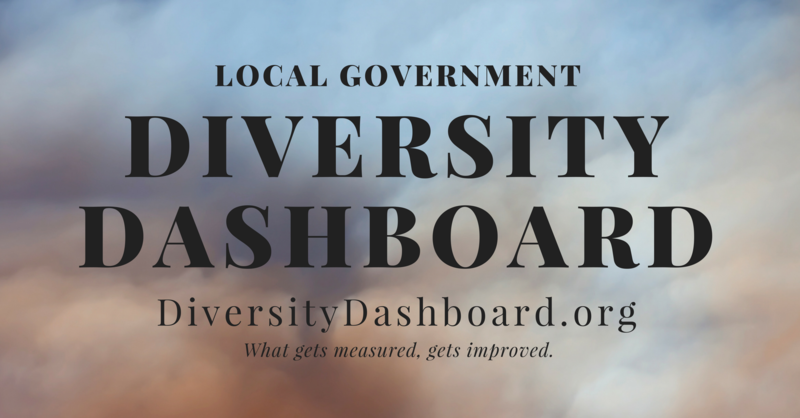 But it also brings awareness to the important role data collection and analyzing plays, while hopefully encouraging more of our government leaders to add their name to ELGL’s Diversity Dashboard! What will the next set of data stories uncover? Email me you data questions: [email protected] and join me next week as we dive into new survey responses and data relationships that interest you!